Advanced SeedThere are 45 products. Auto Biodiesel Mass x Auto Blueberry, two of the most recognized and genetic all-time winning combined into a new autoflowering strain. This is the new Autoflowering Kaya - 47 strain. It is perfect for growing in small places, moreover they are easy to hide due to their small size. Its genetics afford to collect it during Spring and Summer. New York City Diesel Autofloreciente.Mantiene las excelentes propiedades de las Diesel en cuanto aroma, potencia y producción. Ramificación contenida, ideal tanto para Indoor y como para Outdoor. Sabor cítrico, con matices de uva y especias. Variedad Autofloreciente creada a partir de la combinación de genéticas Auto Critical Mass con una selección de nuestra mejor Auto Kaya 47. La herencia genética de Auto Skunk 47, la convierte en una planta robusta, resistente a las plagas y a condiciones climáticas desfavorables. Sweet Dwarf is an autoflowering strain perfect for guerrilla growing due to its compact structure and short flowering time, which reminds of its indica background. Top 69 belongs to a new generation of autoflowering cannabis strains.From a selective inbreeding we finally got a stable bigger plant to answer the needs of our customer for bigger autoflowering plant. 70% Sativa, 30% Indica. It has been selected by New York City Diesel, one of the most awarded plants in the cannabis cups. A maximum of 10 days of growth is advised for indoors to avoid a too big final size. Fast and rich outdoors harvest, it produces abundant branches and infinity of buds. Pianta che unisce la struttura e la grande produzione di gemme e resina del nostro Critical con l'intenso aroma e il sapore di limone e pompelmo. Critical Soma is a true super hybrid, combine in a plant the speed, productivity and power of our Critical genetics with the delicious aroma and taste of the legendary Somango. It produces a thick smoke and sweet to taste, with hints of tropical fruit and the intensity of Critical. Mostly Indica. White Widow selection. Highly resinous. Its smaller size is compensated by the great deal of resin that you can find in its buds. Sweet-and-sour aroma. It intense smell increase during flowering until high levels. Very intense taste. Haze x White Widow. One of our strongest strain. We have obtained this very potent and stable strain by crossing our best sativa mother plants with an indica to reduce the long flowering time typical of the haze. Kush and South African Sativa crossing. 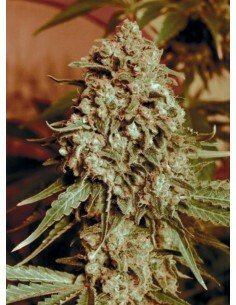 A typical Indica buds plant with a larger production because of its Sativa´s influence bigger size. 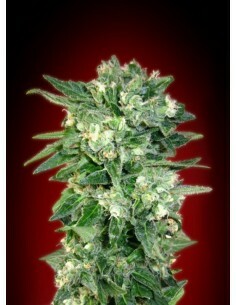 Selection of Jack Herer, mainly Sativa with a touch of Indica to provide a sweet flavour and a shorter flowering time. Vigorous Sativa hybrid, with exquisite aroma and strong and lasting effects.Crossing of a selected Kali Mist, adapted to Mediterranean climate for over 9 years, x AK - 47, the result is a mostly Sativa strain with a short flowering cycle and a satisfactory performance. Ak - 47 Genetics. It has been selected because its flowering period is shorter and has a bigger yield than Ak. Somango Widow is a mostly Indica strain which retains the potency and high resin production of Widow family, but with an exuberant branching and a larger bearing/size. It has a delicious sweet Mango flavour and tropical fruits aroma, qualities inherited from the Somango genetic. Almost pure Indica strain, with a strong and pungent aroma and delicious taste, it develops dense buds with limited number of leaves. Intense and lasting effects. Ibrido di grande sapore e produzione eccellente che nasce dall'incrocio di due dei cloni più pregiati del nostro pool genetico privato, Critical e Purple OG. L'Amnesia è una delle varietà a predominanza Sativa più conosciute al mondo, per diversi e buoni motivi. È una pianta veloce e facile da coltivare, dall'elevata produttività sia di cime che di resina. A causa del suo delizioso sapore e dei suoi potenti effetti euforici da Sativa, l'Amnesia è molto apprezzata dagli appassionati di Cannabis. Versione automatica della nostra Afghan Skunk. Pianta resistente e adattabile a tutti i tipi di colture. Ottima produzione di resina con un intenso aroma di hashish. Potere afgano, delizioso e rilassante. Pianta con predominanza Sativa. Risultato dell'unione tra Original Amnesia e Haze Autoflowering. After selecting the most resinous and productive plants from AutoCritical and Autodiesel Genetics, we have obtained the new BioDiesel Mass, keeping the diesel smell and flavour, with a rich output and large amount of resin. Varietà automatica dal profumo intenso e dolce di mandarino con sentori di buccia di limone e pompelmo. Si sviluppa un enorme bocciolo centrale che copre dalla base alla corona e rami secondari con grandi boccioli di calibro. Auto con buona ramificazione da cui si ottengono germogli abbondanti e lunghi che coprono la pianta quasi nella sua interezza. Aroma fruttato e sapore dolce di banana, pesca e mango. I suoi effetti sono più che soddisfacenti a livello fisico e mentale. Auto Heavy Bud es un híbrido autofloreciente de nueva generación, se trata de una genética con clara dominancia Indica, buena ramificación y un excelente rendimiento. Esta nueva Auto es fruto del cruce entre genéticas Skunk Red Hair y genéticas Indicas Auto. Auto Ananas x Auto Gorilla Glue Questa volta abbiamo messo insieme due fantastiche macchine per il tuo relax e divertimento: Auto Pineapple discende dal famoso Pineapple Express, una varietà potente con un gusto incredibile premiato dal suo Trainwreck e dai suoi progenitori hawaiani.